Evelyn Berni, staff accountant, joined our firm in 2018. She was raised in Fresno where she learned responsibility early. She was the middle child with a sister ten years older and one seven years younger. “My big sister helped raise me and I helped raise my younger sister,” she says. Evelyn’s conscientiousness extended to her school work. At Sunnyside High School, she excelled in academics and graduated valedictorian. While in high school, she had the opportunity to visit Ivy League schools on the east coast. For a California valley girl, it was an eye-opener. She particularly loved Brown University in Providence, Rhode Island. She applied to Brown, Cal Berkeley, UCLA, and California State University Fresno. She was accepted to all of them! Evelyn chose Brown and loved it. “I went from living in one of the largest states in the U.S. to the smallest.” She spent a year and a half there until family called her home. She finished her education at CSUF with a Business Administration, Accounting degree. With a December graduation in 2014, Evelyn was primed for tax season. 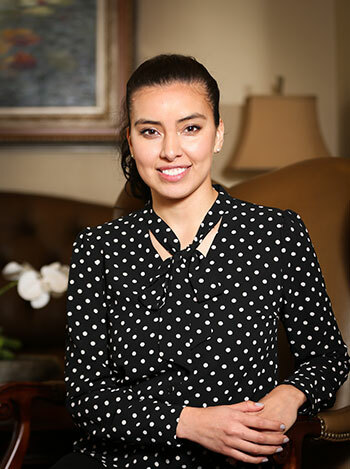 She began as an intern for a Fresno firm. After tax season, she remained with the firm full time working mostly on medical accounts. She joined another Fresno firm and worked for two years on mostly real estate accounts. We are pleased to have such a diligent and careful new accountant on our staff. In addition, she is working toward her CPA license. When she is not working, Evelyn and her husband love playing with their two “babies" — twin maltipoos. They also enjoy trying out new eateries. “We love everything from nice restaurants to hole-in-the wall places to taco trucks on street corners. We are total foodies." One tip she offers, “Our current favorite sit down restaurant is Cracked Pepper Bistro. Their bread pudding is amazing."